I've been pretty lucky lately with my eBay finds. Every so often I get into a bit of a "bidding" mood and I think what I've ended up with in the past couple of months has been A-1. 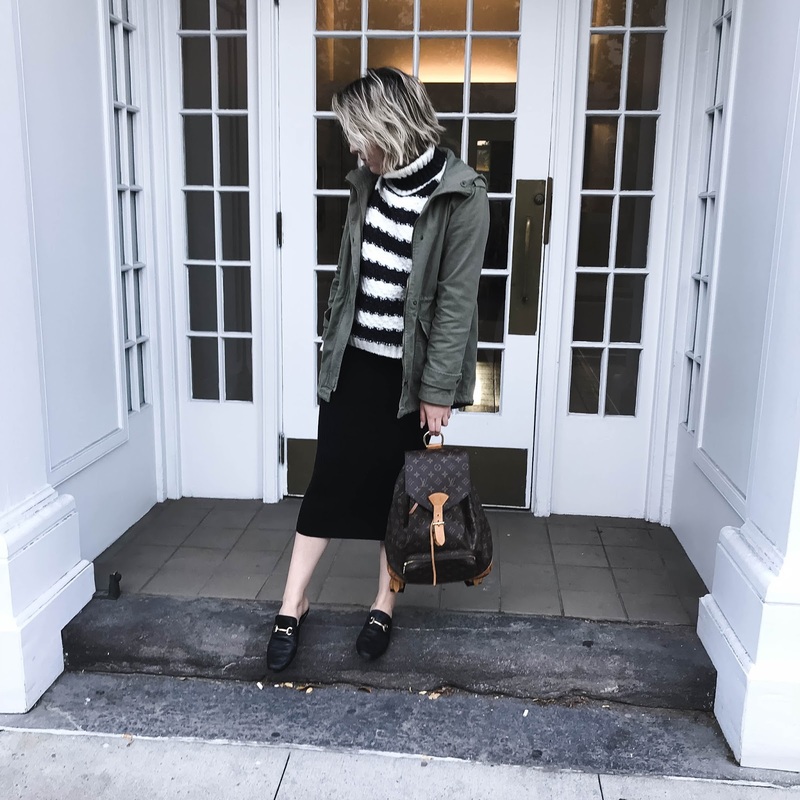 I have to admit eBay can be a bit tricky, so I'll also be sharing some tips on how to navigate, inspired by a recent post by my friend Natalie. The first bag I went after was the Louis Vuitton Montsouris GM. This one took a while to come to fruition, since I spent a while trying to decide whether I wanted the MM or the GM, and another long while trying to decide what kind of condition I was willing to pay for. I ultimately came across this vintage one from 1995, with a small tear in the vachetta leather and some water stains on the base, but otherwise in great shape. I ended up getting it for $300, and getting the tear repaired for $5 at the local cobbler. I'm thrilled with it, to be honest. It fits everything I need and looks so chic. I love that this backpack is so versatile. I'm not usually a monogram fan but for some reason the print on a backpack just "works" for me. 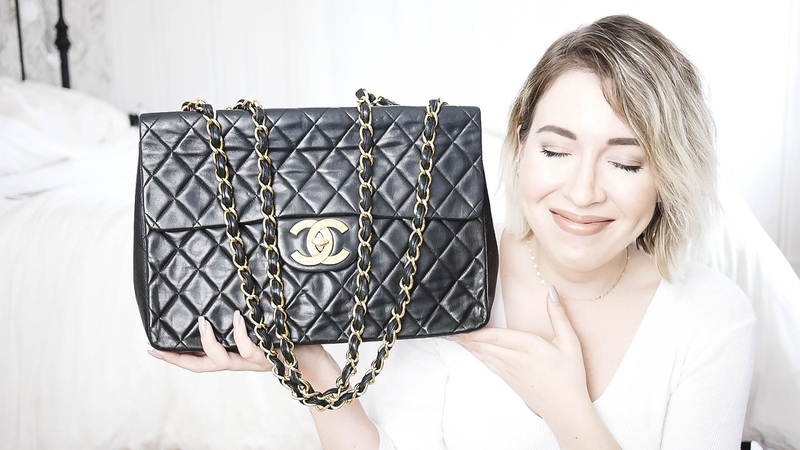 Now for the "piece de resistance"... a vintage Chanel Jumbo XL. This has been my dream bag for years now, and I had honestly resigned myself to the fact that it would never be mine. Fast forward to a month ago and I was seeing some on eBay auctions for prices I was willing to pay. So, off I went down the authenticity research rabbit hole and eventually started bidding. This beauty circa 1994 is my prize. It's in great shape, with the only issue being that some of the serial number is rubbed off. I can see it starts with 29 and a couple other numbers, but the sticker itself is intact, which is key. 1) Do your research. 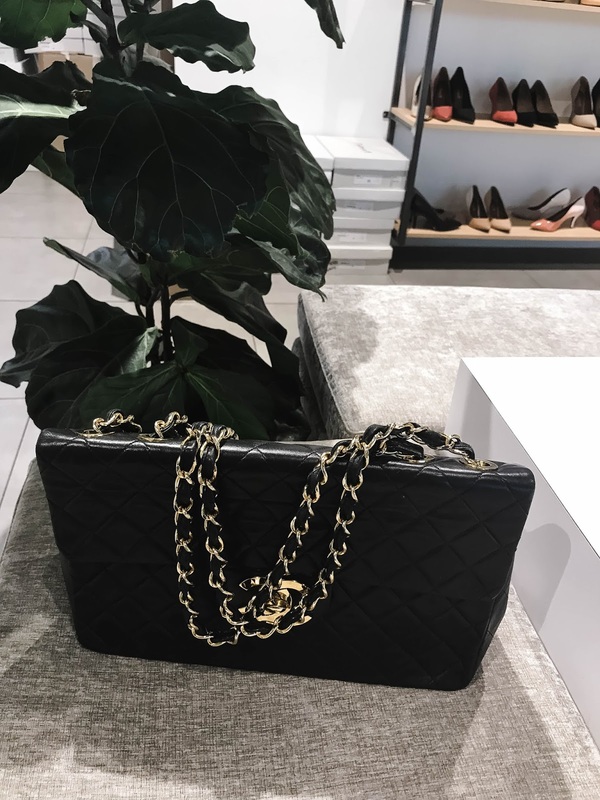 Look at as many listings as you can so you can figure out what kinds of bags in all types of conditions typically sell for. Hit the "watch" button on some of the auctions so you can follow it and see how crazy the bidding gets. Look at all the pictures, read the descriptions carefully. 2) Decide what kind of condition you can live with, and decide on a maximum price you're willing to pay (with a bit of wiggle room - I once lost an auction by $20). The frenzy of the auction can turn into more of a desire to win instead of the actual purpose of buying the item. Some condition issues can be repaired, some can't. Remember, there will always be another one! 3) Don't bid right away. There can be an urge to place a bid right away, but that can drive the price up too far too quickly. The key time of any auction is the last 5 minutes or so. Watch carefully what others are doing, and in the last 20 seconds or so, have your maximum bid ready to go (try to stay away from nice round numbers, like $1200, since people gravitate towards those when deciding their maximum bid). Hit submit with about 5 seconds to go. You do run the risk of losing out by $20, but it's also another good way of not getting caught up in the moment and spending more than you had planned. 4) Look at Japanese sellers. It's not foolproof, but Japan has very strict counterfeiting laws, so reputable Japanese sellers (look at their feedback) are generally safe bets. PayPal and eBay have pretty good protections for buyers, so if you are unsure about authenticity, you can get it looked at after the fact. I purchased my LV backpack from Yuko0702 and my Chanel from Boom2Hanten. 5) If the price looks too good to be true, it probably is. This applies more to the "buy it now" part of eBay, but most sellers running auctions usually have a "reserve" price that needs to be met in order for the purchase to go through. Carefully check the listing and pictures - make sure they all look like they're from the same bag, on the same background. Pictures can be stolen easily. If something seems off, try a reverse Google image search. Oh millennial pink, how I've tried and tried to resist your allure. Your soft, happy hue, your maddeningly neutral, "go-with-everything" tone. Evidently, it was to no avail. I'm converted. My name is Chloë, I'm a millennial (ugh) and I love pink. The youths have won. Take me to your leader! So you may already be sick of all my pink if you are a casual peruser of my Instagram... or, it's entirely possible you've missed all of my posts due to the terrible Instagram algorithm of engagement death. But I digress. My point is that the pink has been a slow burn that has now combusted into full-blown buy-in. Exhibit One: a fully pink suit that I most definitely wear to work. The jacket alone is a fantastic piece that (surprise!) goes with everything. Zara FTW, once again. More exhibits here of pink being generally pretty great... 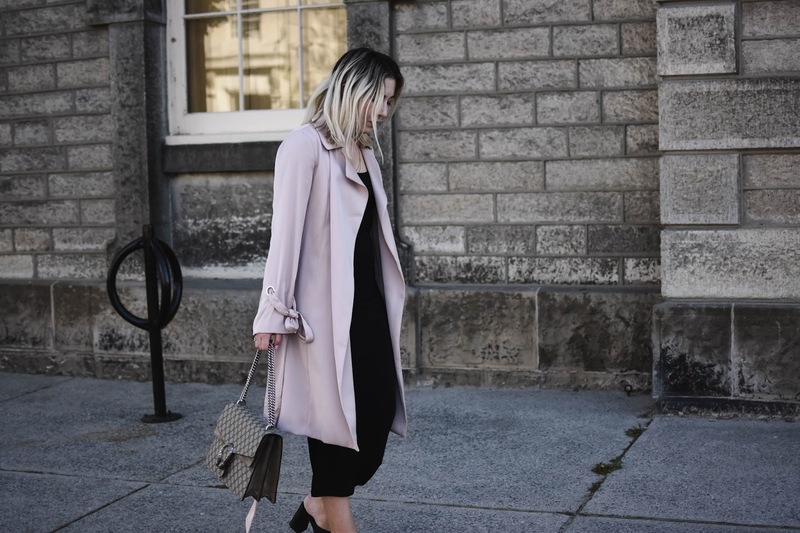 I also had the opportunity recently to pull some pieces from Ever New's spring collection, and got to play around with a beautiful pink trench coat and a shimmery midi skirt, also pink. Borrowing pieces is new to me, but it was a really cool thing to try (though this instance was quite the saga due to unforeseen circumstances!). Ever New Jolet trench here (currently on sale! ), similar via ASOS here, Forever 21 here. 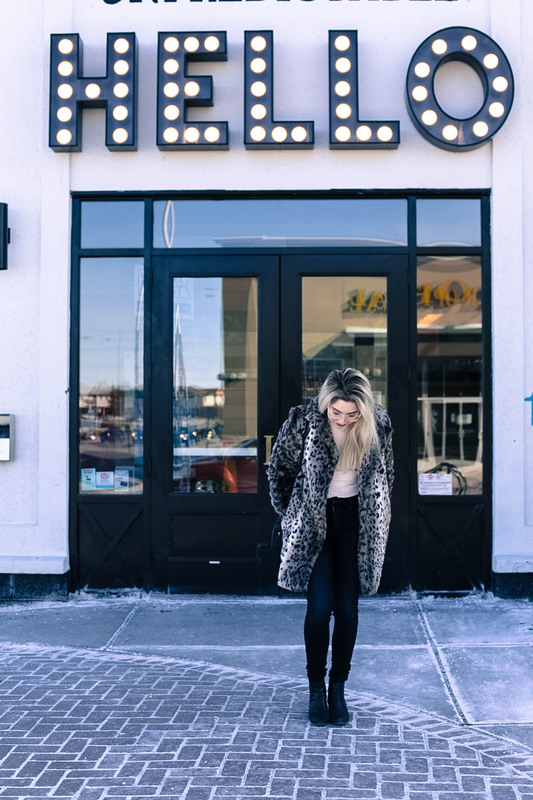 "Bloggers pretending they have dropped something on the ground and are casually looking for it while having their photo taken": a series by Chloë Gordon. 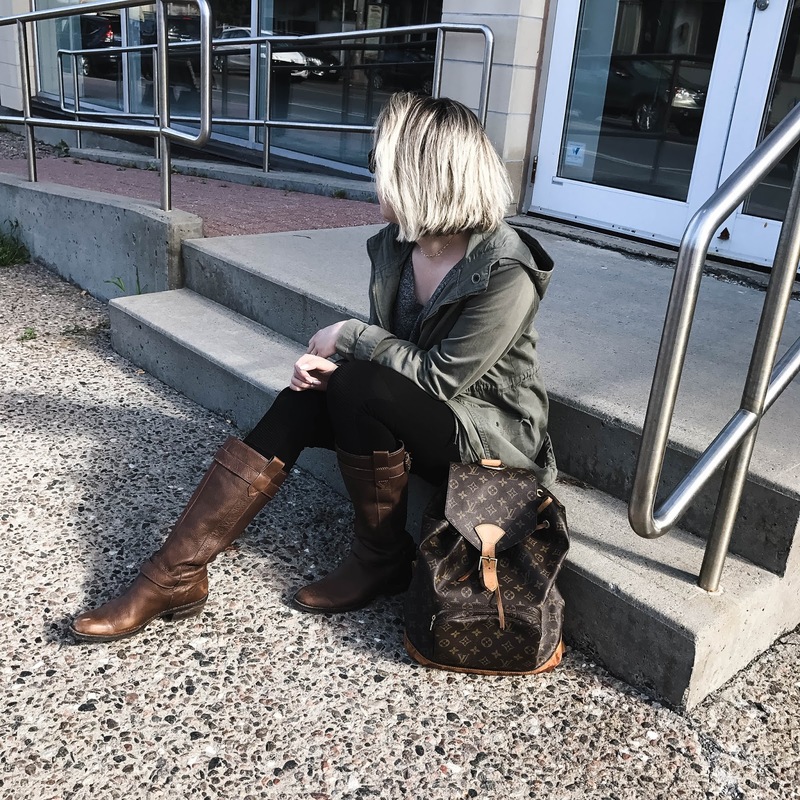 This pose is becoming a serious problem/crutch for me (and many, many other bloggers, based on the 700+ of you I follow on Instagram). I guess the thing is that I don't love the way my face looks in a lot of photos, so the more hair and less face I can show, the better. Or, I can start practising my "smize" and just get on with my life. That's also an option. 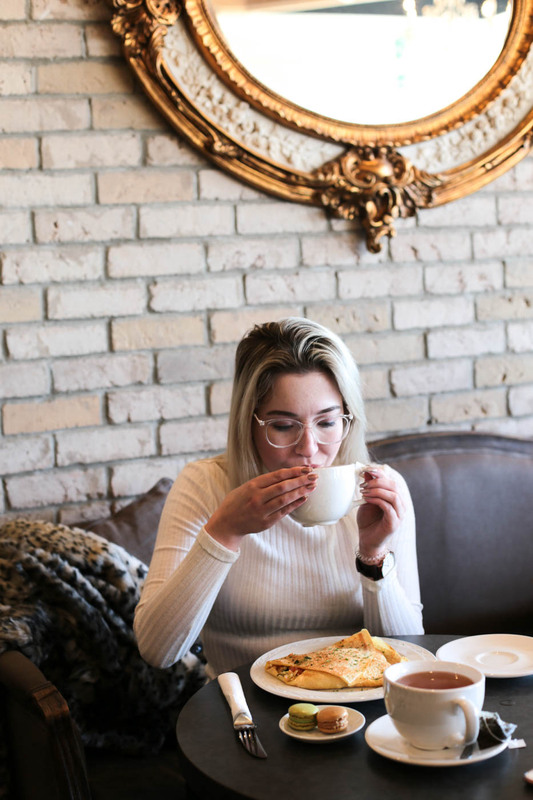 I went on a little exploration adventure with my friend Natalie last weekend - she talked me into driving us to (wait for it) Barrhaven. We checked out a thrift store called Plato's Closet, that ended up having quite a few diamonds in the rough. I ended up with a brand new with tags Forever 21 utility jacket for $16, so I won't complain too much about the 30 minute drive out to the boonies. A similar current-season one is available at Forever 21 here. Natalie ended up with some brand new One Teaspoon boyfriend jeans, which was pretty fateful, given the fact that she had spent some of the ride out to Barrhaven decrying how expensive these exact jeans were when buying new, even though they were exactly the style of boyfriend jeans she wanted. 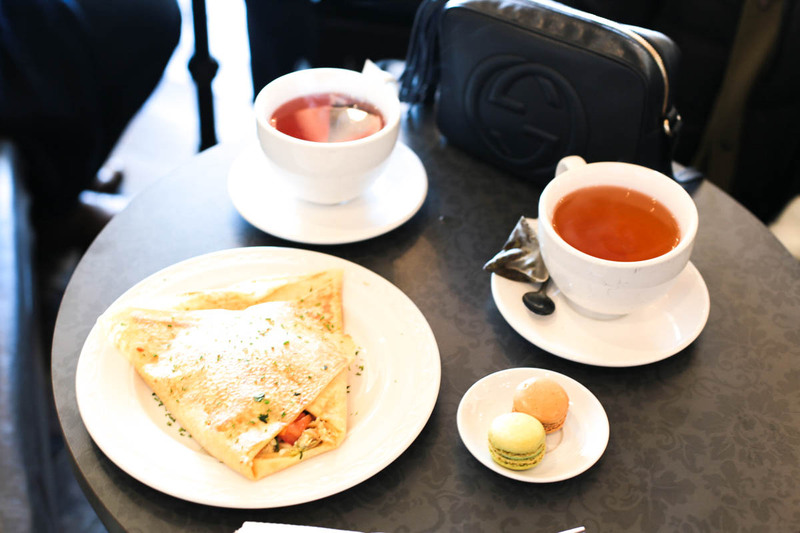 We also ran into Patricia from @fashioncanadians, who had come in with some friends for high tea... so obviously this is the place to be for bloggers! Thanks to Natalie for the photos! 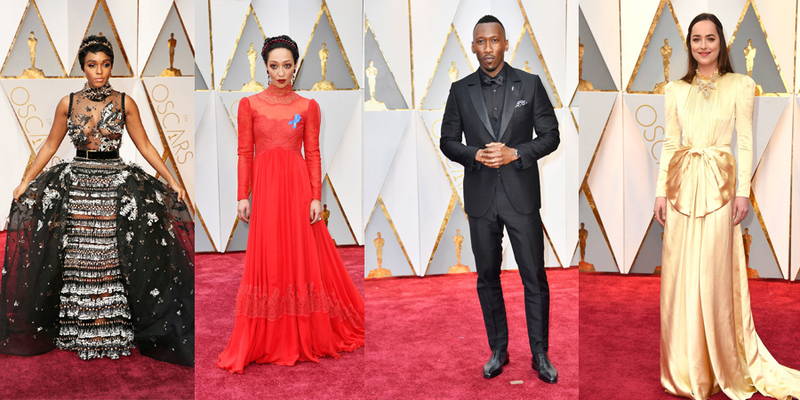 Needless to say, everyone has a lot of opinions about what went down at the Dolby Theatre last night - sartorial, political, or otherwise. I thought I'd share some of my sartorial opinions with you all, in the form of my very first best/worst dressed list. Here goes. Stunning. Absolutely stunning. Not everyone could pull this Elie Saab Couture dress off, but Janelle has nailed it. I love that she stuck to her usual black and white colour scheme, but turned her whole suit-wearing trend on its head. The fit is perfect, her accessories are spot on, and she looks just the right amount of "extra" without being too extra. Beautiful. Absolutely beautiful. This is another dress that most people could not pull off, but Ruth looks elegant and chic and absolutely radiant in Valentino. The fit is perfect on her, and the soft drape of the skirt keeps it from looking fussy or matronly. This is a very fashion dress, and it suits her beautifully. File this one under BFF Goals, since both of these beauties are totally slaying the red carpet here. No surprise to see Michelle in Louis Vuitton, and I love the simplicity of the design. Busy's showing off her bangin' bod with those cool cutouts, and I'm loving her ACLU ribbon! Slay, mama. Taraji looks like she knows she looks amazing, and knows that you know she looks amazing. The styling of the whole look is perfect - the old Hollywood shape of this Alberta Ferretti gown mixed with the modernity of the blue velvet is super chic. I'm really digging this black-on-black suit. Men have a bit of a rough go in terms of formalwear - either wear the same boring suit or tux as every other dude on the red carpet, or potentially look like a waiter (unfortunately, see Dev Patel and Jamie Dornan's suits). Mahershala took a bit of a risk, and showed us something different for menswear. Bravo! I've been trying to keep my list focused on people who are ~relevant~, but Kirsten Dunst in Dior is really, really doing it for me. Perfect proportions, perfect length, perfect neckline. I don't love her beauty look, but this dress is spectacular. The top of this Oscar de la Renta dress is the best part. I'm loving the dramatic angles mixed with the romantic and soft ruffle of the hem. It's a perfect balance, and Brie looks absolutely stunning. 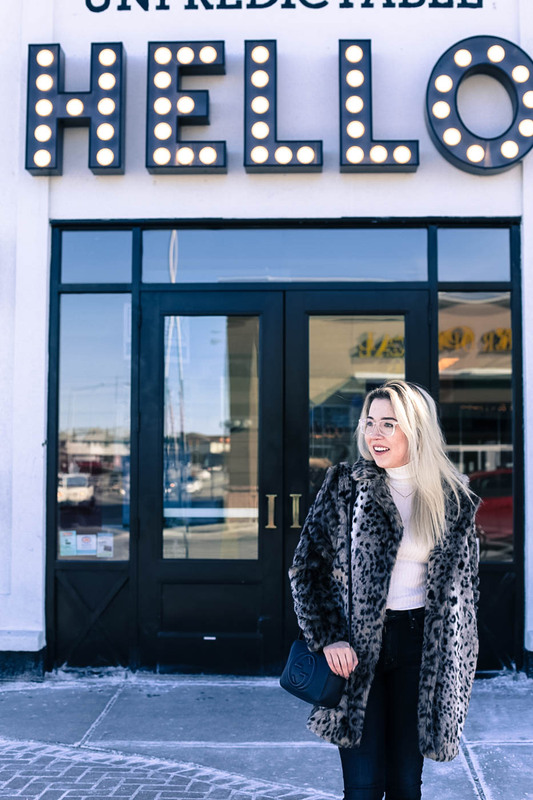 She's on-trend with the velvet, but still classic and chic. If I had to pick just one worst dressed (I don't, but still) this would certainly be it. Awful. Just awful. This Gucci is an absolute monstrosity, and I'm actually appalled to see this on some prominent best-dressed lists (*ahem* Vogue). The colour is super unflattering on any skin tone, the fabric looks cheap, and the style is ultra-matronly. It looks kind of okay in some red carpet photos, but the moment she walked out on stage with Jamie Dornan to present, any redeeming qualities dissipated. I hate this dress. It's giving me major early-2000s vibes, and not in a good way. The pattern of this Alaia dress is very dated and casual, and the belt is just awful. I'm also confused by the seemingly random sheer slits through which you could definitely see her Spanx. Puzzling. Oh, this is tragic. Especially when compared to Ruth Negga's beautiful gown of a similar style. There's too much going on with Ginnifer's Zuhair Murad dress, from the sheer panels, structured skirt, and high neck. The length seems a bit awkward too, especially given how stiff the skirt looks. I think it would have been better as a tea-length, but it's still a big fail. I think I like what they were going for here, but this whole look just looks off. The cap sleeves and weird almost-too-tight bustier, plus the high-low hem... the proportions and shape of this Louis Vuitton gown just seem strange to me. I've grouped these two here together since they're essentially wearing the same suit. I've never been a huge fan of the white top/black bottom look for men's suits, since it's dangerously close to being waiter or valet attire. At least the fit of Dev's suit is good, while Jamie's pants look too short and ill-fitting. So there you have it! My very first best and worst dressed list. There were loads of other dresses that I liked (and disliked) but didn't feel strongly enough about to include here. These were my real hits and misses. Let me know in the comments what your favourites were!